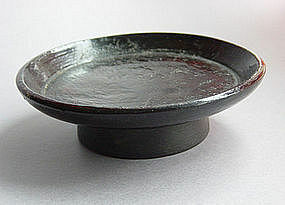 Takatsuki; footed tray. Wood with black lacquer, ca. 1900. H.1.75"(4.5cm) x Dia.6"(15cm). 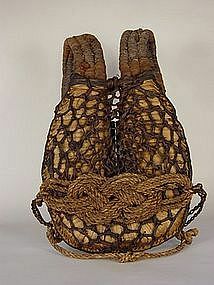 Such trays were used for food service or offerings. Suitable for a sweets dish in tea ceremony. 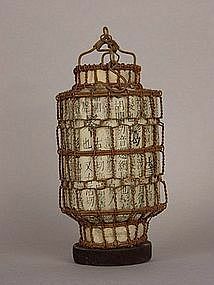 A storehouse (kura) lantern(andon) from late 19th century Japan, made of wooden base, and metal wire body, and hanging hook. Interior paper is a later addition. I have found a long Japanese medicine bottle that fits perfectly inside the lantern, making it suitable for flower arranging. H.17cm(6.7") x Dia.8cm(3").